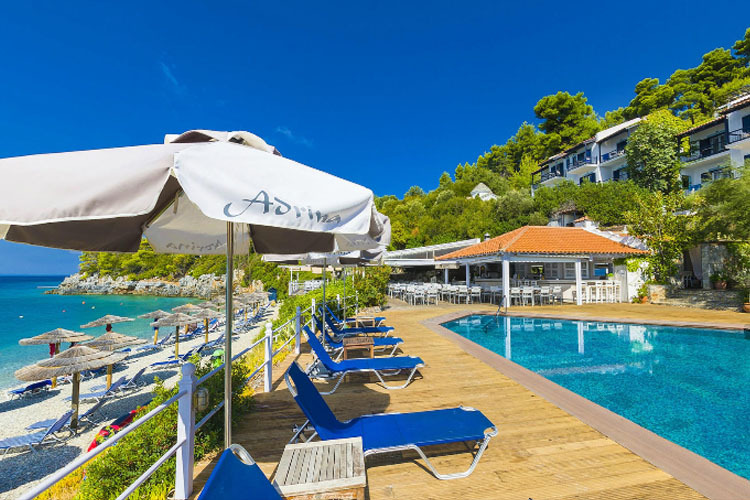 Built amphitheatre-style on a gentle slope reaching down to the beach, Adrina Beach Resort & Spa is set in a purpose built resort on the island of Skopelos. 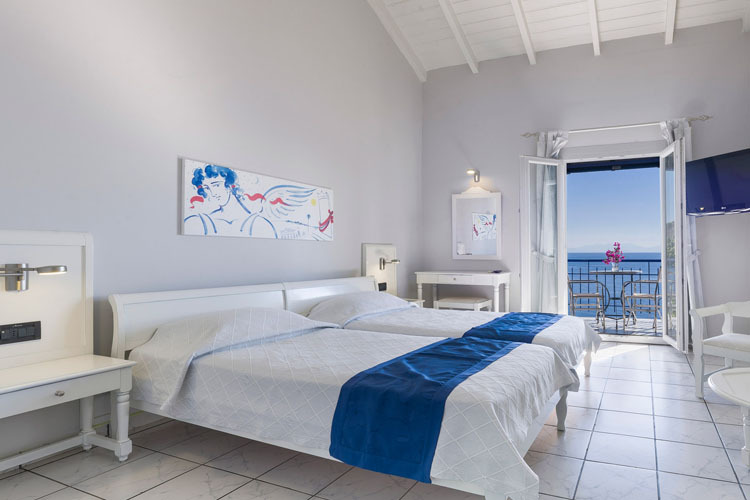 Enjoying a privileged location, this charming family owned and run hotel offers delightful accommodation, fine Greek cuisine and a range of exclusive services in an idyllic island setting. 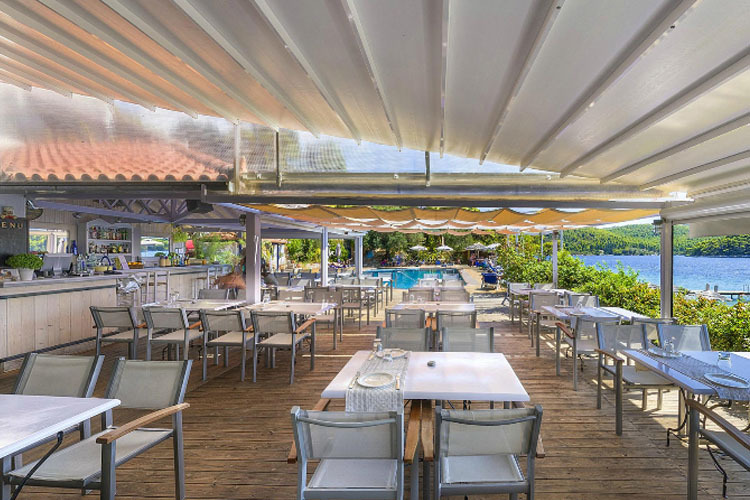 Perfect for relaxing, family orientated holidays on this beautiful island one of the greenest in Greece, Adrina Beach Resort & Spa boasts a private beach area, a jetty and moorings, and a large sea-water swimming pool with a safe children's area. The island's waters are fabulous for diving and snorkelling, and the Skopelos dive centre offers courses for beginners and experienced divers alike. 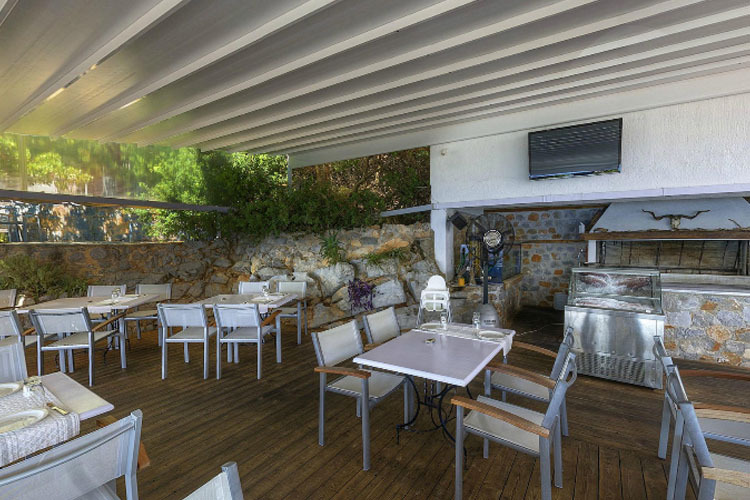 Adrina Beach Resort & Spa boasts a taverna-style restaurant, serving carefully prepared traditional Greek dishes, with a fine selection of fish and seafood from local fishermen. There is also a beach bar and a lush, shaded garden area. 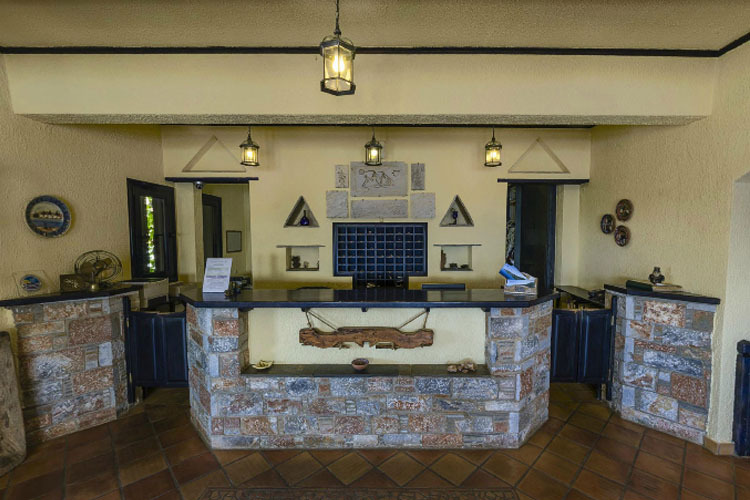 With a view of the courtyard, Garden View Rooms offer guests a welcoming atmosphere. 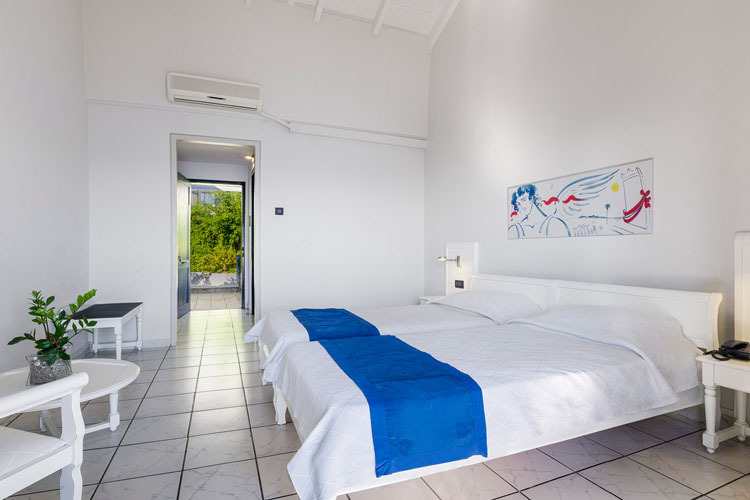 These Twin or Double Rooms (21 sq m) come with an en-suite bathroom, a private balcony, satellite (32") TV, mini fridge, air-conditioning (hot & cold) and a ceiling fan, hair-dryer and bathroom amenities. 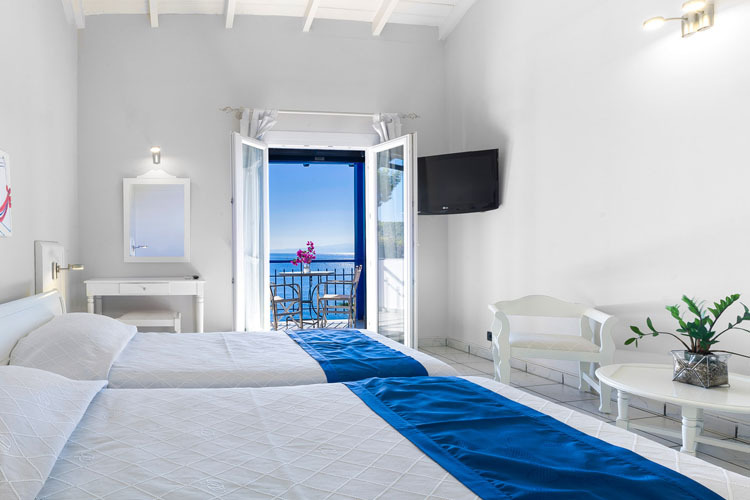 Overlooking the beautiful Aegean Sea and mountains, Partial Sea View Rooms provide a space for complete relaxation. 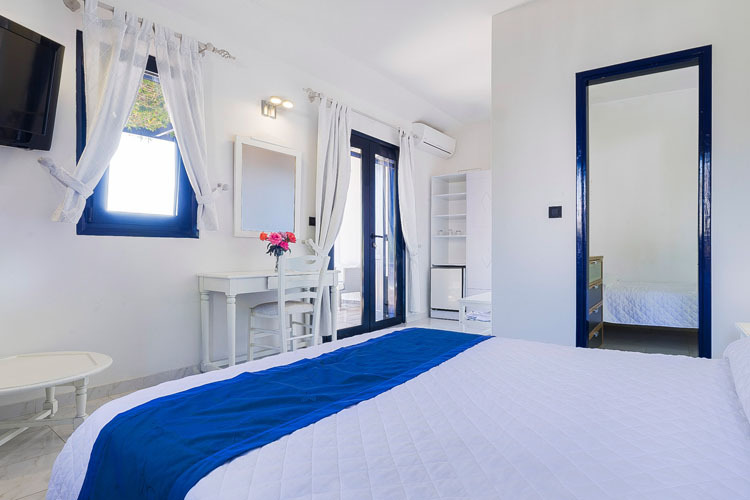 The Twin or Double Rooms (21 sq m) have an en-suite bathroom, a private balcony, satellite (32") TV, mini fridge, air-conditioning (cold & hot) and a ceiling fan, hair-dryer and bathroom amenities. 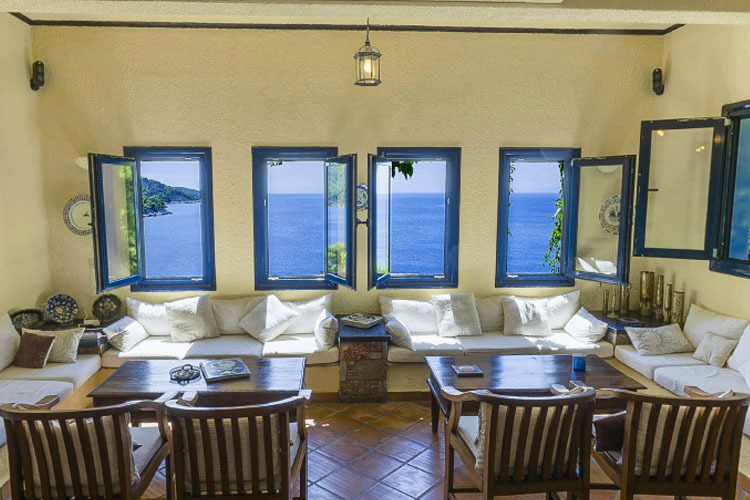 With views of the Mediterranean Sea and Skopelos mountains, Sea View Rooms offer guests a residential ambience. 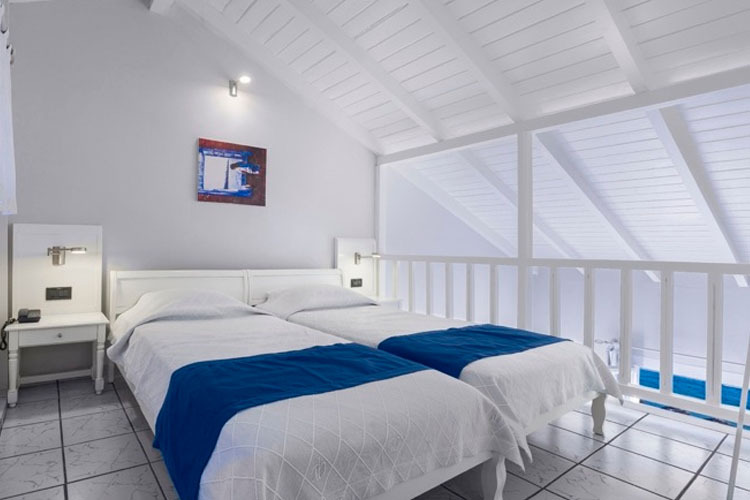 These Twin or Double Rooms (21 sq m) come with an en-suite bathroom, a private balcony, 32" satellite TV, mini-fridge, air-conditioning (cold & hot) and a ceiling fan, hair-dryer and bathroom amenities. 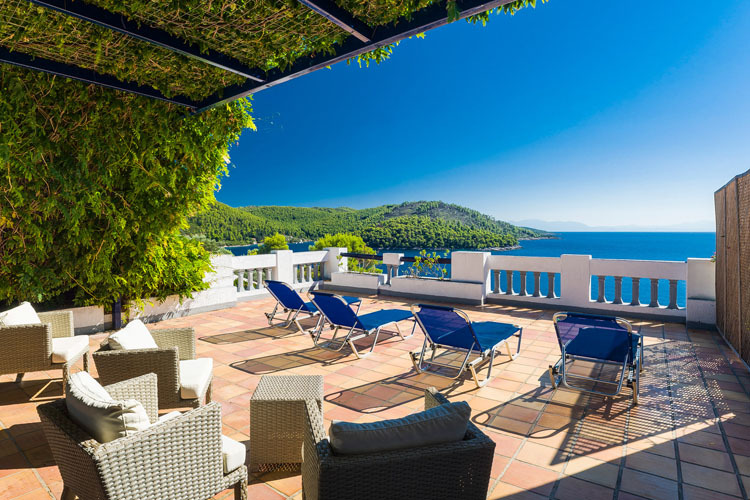 Featuring magnificent views of the Aegean Sea and Skopelos mountains, Full Sea View Rooms offer guests a welcoming, residential feel. 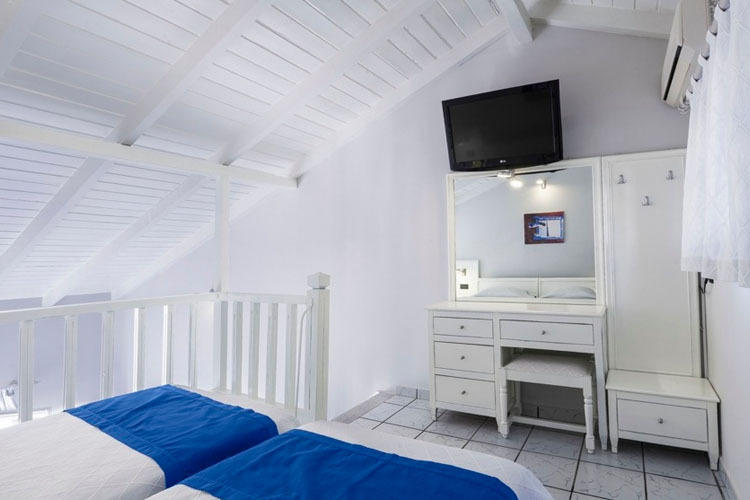 Twin or Double Rooms (21 sq m) have an en-suite bathroom, a private balcony, satellite (32") TV, mini-fridge, air-conditioning (cold & hot) and a ceiling fan, hair-dryer and bathroom amenities. 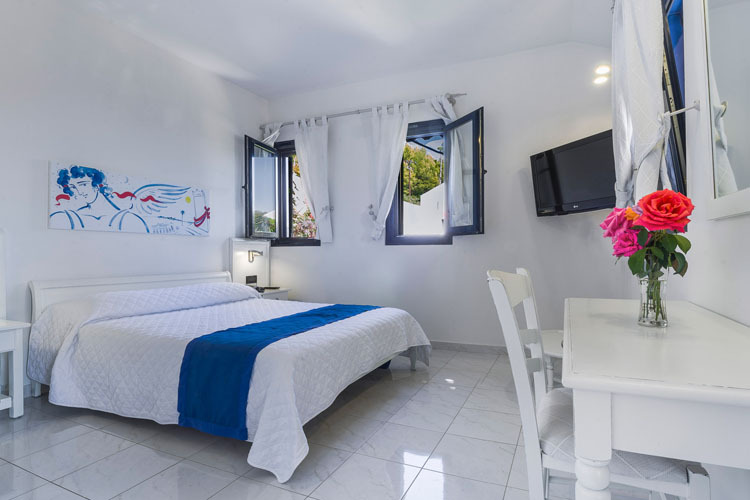 All rooms have 2 connected single beds than can be made up as a double bed. The rooms are also spacious enough to accommodate an extra bed or baby cot. 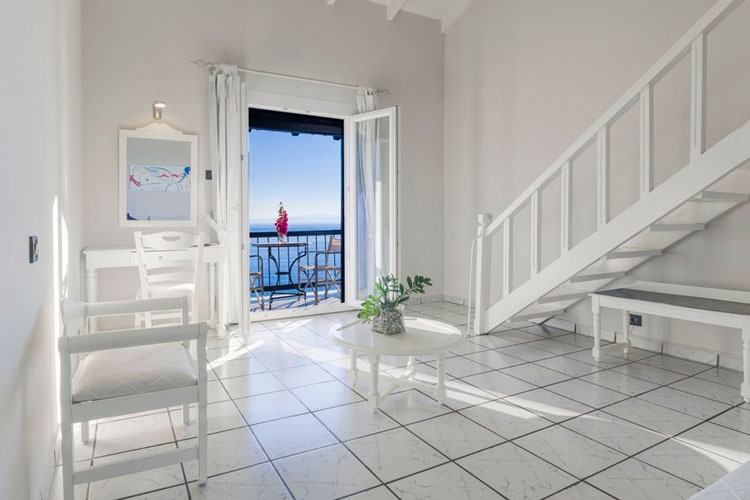 Overlooking the beautiful Aegean Sea and mountains, Partial Sea View Maisonettes provide a place for complete relaxation. The maisonette is a spacious room arranged on two levels that can comfortably sleep up to 4 people. The living-room area and the bathroom are on the ground floor, while the main sleeping area is on a raised mezzanine reached by an internal wooden staircase. Maisonettes are ideal for families, but not suitable for two couples. Like all rooms, they have a balcony, satellite TV, fridge and air-condition (cold & hot), hair-dryer and bathroom amenities. The Quadruple is a spacious room, comprised of two rooms that can comfortably sleep up to 4 guests (30 sq m). There are two bedrooms, one with twin beds (children's bedroom) and one with double bed (parent's bedroom) and a bathroom. These two bedrooms are separate, but access to the bathroom is only through the twin bedroom, so the Quadruple is ideal for families, but not suitable for two couples. 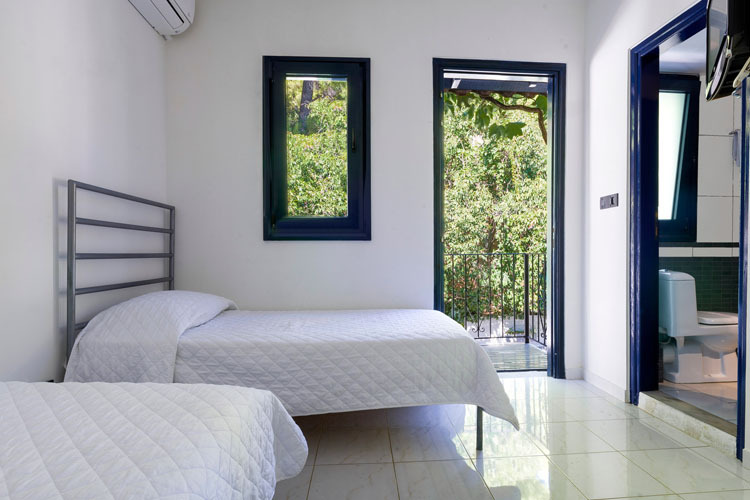 Like all rooms at Adrina, they have a sea view, a 60 sq m terrace, satellite TV, fridge and air-condition (cold & hot), hair-dryer and bathroom amenities. 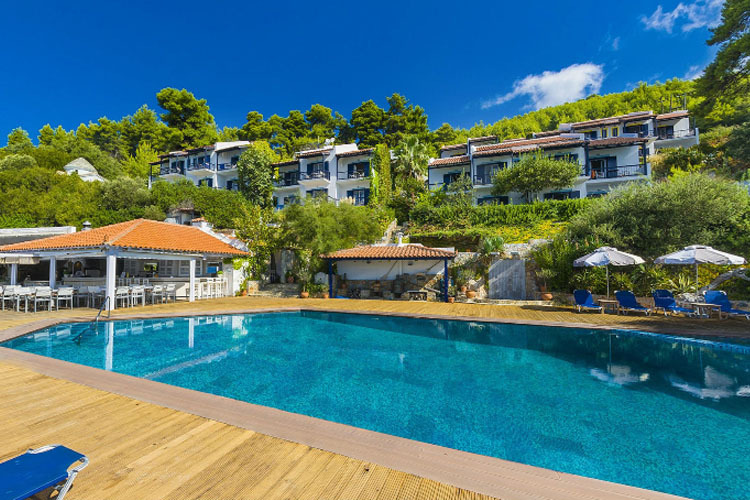 With views of the Mediterranean Sea and Skopelos mountains, Sea View Maisonettes offer guests a residential feel. The maisonette is a spacious room arranged on two levels that can comfortably sleep up to 4 people. The living-room area and the bathroom are on the ground floor, while the main sleeping area is on a raised mezzanine reached by an internal wooden staircase. Maisonettes are ideal for families, but not suitable for two couples. Like all rooms, they have sea view, balcony, satellite TV, fridge and air-condition (cold & hot), hair-dryer and bathroom amenities. All rooms and maisonettes feature: balcony; air-conditioning; 32" flat-screen TV with satellite channels; queen-size bed or twin beds; Adrina & BVLGARI toiletries; slippers; hair-dryer; mini fridge; laptop-size safe; voltage 220 volt; international direct dial telephone; free wireless internet access; wake-up service; baby cots. 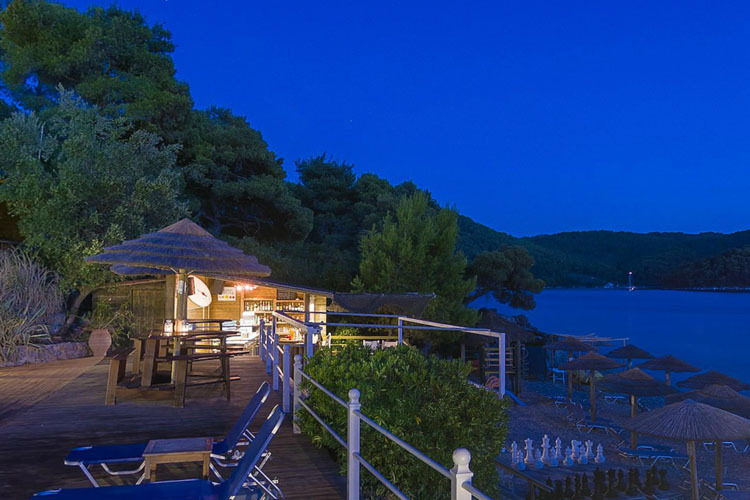 Nearest airport: Skiathos Island National Airport - 29,1 km.